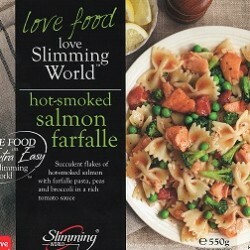 So on Monday , l was in Iceland just doing the normal grocery shopping and l noticed they had a lot of slimming world meals and l've heard people talking about them so l wanted to pick some slimming world stuff up . I picked up two soups and one meal . The meals are on the more expensive side 4 euros each . I didn't want to pick up loads of them and then find out l didn't like them so l got one. 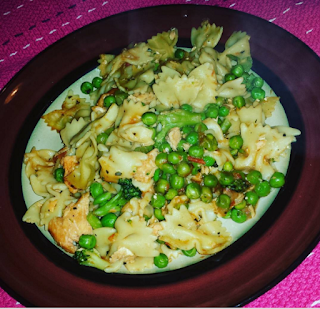 To be honest l didn't like them , l found the pasta to be overcooked , parts of the salmon were a bit tough , some of the peas were mushy and some were not , lt just didn't taste nice and the texture was really bad. I think the problem with these ready meals is everything is cooking at the same time and some things cook quicker than others. If l had of made this myself it would of been better because you'd put ingredients in at different times. It wasn't awful though , l ate it , l just wouldn't buy them again but the great thing is about these you have the recipe at the back of the packaging so you can make it yourself. Not a great product but for a ready meal it was okay, I can't wait to try the soups to see what they taste like .I will do a review on the pea and mint soups next .